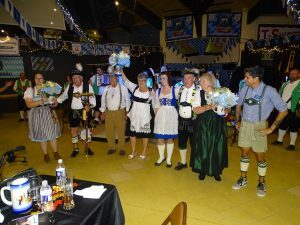 Hans and Erika Bandows, as a way of saying thank you to all of their new clients and the new friends who had welcomed them to Big Bear Lake, decided to hold an Oktoberfest just like the one they had attended so often in Munich. 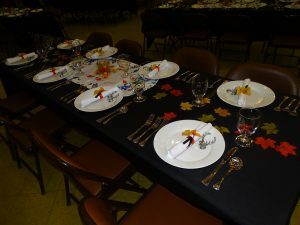 For many days beforehand and with the help of their two daughters, Janet and Monica, the Bandows’ cooked, cleaned, decorated and cooked some more. Erika in the kitchen preparing authentic German food. The smells of sauerkraut and rouladen filling the lodge and making everyone’s mouths water. Hans, with sweat on his brow preparing the dance floor, hoisting kegs of beer and rounding-up the band. 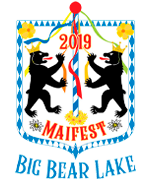 Finally, with anticipation in their hearts, the Bandows household greeted their first guests and what would become a tradition for more than four decades, the first Oktoberfest in Big Bear Lake began. At precisely 12:00 noon Burgermeister Hans struck mallet to wood and cried “Ozphat Is!” cracking open the first keg of Oktoberfest beer. The band followed his lead and the merry sounds of the first polka filled the mountain air. Today the tradition continues. 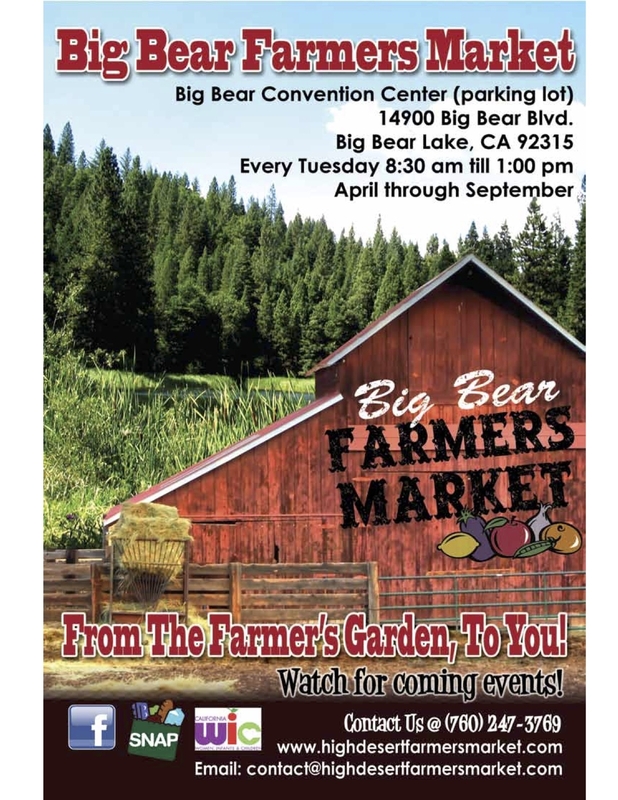 The Big Bear Lake Oktoberfest has grown to be one of the largest and most authentic on the West Coast. Oktoberfest “Unplugged” celebrates the heritage of Big Bear’s event. 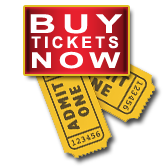 Gather together with many of the personalities who helped start and grow this annual festival. Enjoy Rouladen, red cabbage, Apfel Strudel, German spirits and beers like those introduced back in 1971. 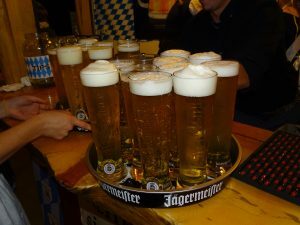 A night of singing, dancing, eating and, of course, drinking in true German fashion. 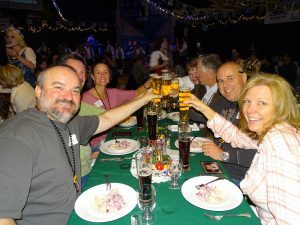 Welcome to “Oktoberfest Unplugged” – an evening of traditional German cuisine and beer, music, and merriment. The following is the night’s menu. We are looking forward to celebrating an intimate, traditional German evening with new and old friends. Festivities begin at 6:00 p.m. with passed appetizers and a no-host cocktail hour. Seating for Dinner is at approximately 7:00 p.m. Herring salad made in true ‘old World’ fashion served along with a hearty portion of German Cold Cuts & Cheeses mixed in a salad. Lauchsuppe is a definite cold weather favorite in Germany. Made with leeks, potatoes, half & half cream, and chicken broth, this creamy soup is healthy and hearty. Salads to start a German dinner – includes a marinated asparagus salad and mixed green leaf salad served with a vinaigrette dressing. A classical Sunday dish in Austria and Germany, Rindsrouladen is a thin beef filet rolled and filled with a blend of mustard, bacon and dill pickle. Pork Loin, a German Sunday dinner favorite, marinated in a honey mustard and beer; then roasted and served with a jus and Beurre Manie sauce. Sides include Red Cabbage, Spaetzle, and Green Beans smothered in bacon bits and onions. Schwarzwald Kirsch Kuchen (Black Forest Cherry Cake) the German-way! A true Bavarian speciality.